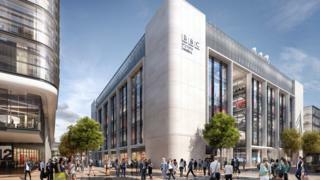 Developers behind the new BBC Wales headquarters in Cardiff have applied for more security features. Existing planning permission allows for bollards to be placed around three sides of the building in Central Square. But Rightacres has asked Cardiff council to extend approval to a fourth side to mitigate the risk of car bombs. It said the threat posed by a vehicle used as a weapon has increased. In a letter to the council, Rightacres said it also wanted to scrap the plan for a layby in Wood Street next to the building. "Monitoring of an evolving threat has been ongoing and a number of factors have resulted in the BBC wishing to increase its protection on the Wood Street elevation," the letter said. "Primarily, the threat posed by a vehicle used as a weapon or as an improvised explosive device has increased and in the last few years there have been a number of highly publicised deadly vehicle attacks."